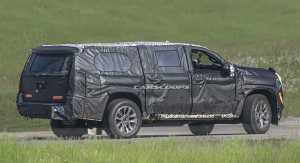 After unveiling the 420 HP 2019 Suburban RST earlier this month, Chevrolet managed to one-up themselves by taking an all-new 2020 Suburban prototype out for a drive. Camera lenses were of course present. 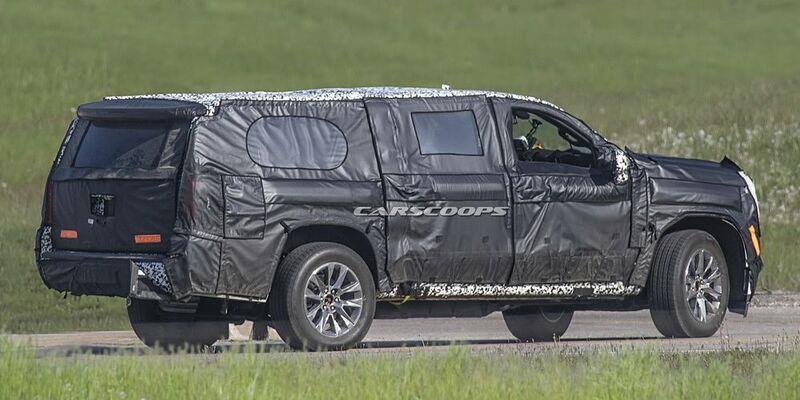 This is an exciting moment for full-size SUV enthusiasts (yes, they’re out there). As much as people love all these new subcompact crossovers, we reckon there will always be a place for vehicles the size of the Chevrolet Suburban. 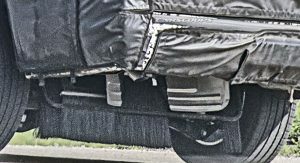 Rumor has it that it was the latest Ford Expedition that prompted Chevrolet to add an independent rear suspension (IRS) to their all-new Suburban. The Expedition has been really well-received, not only because of its IRS, but also because of its aluminum-body construction and turbocharged engine. How much can we see? 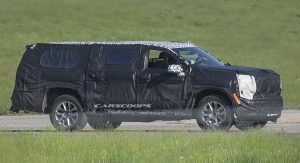 It’s clear that GM went to extreme lengths to hide the new Suburban’s rear suspension by adding under-body camouflage. 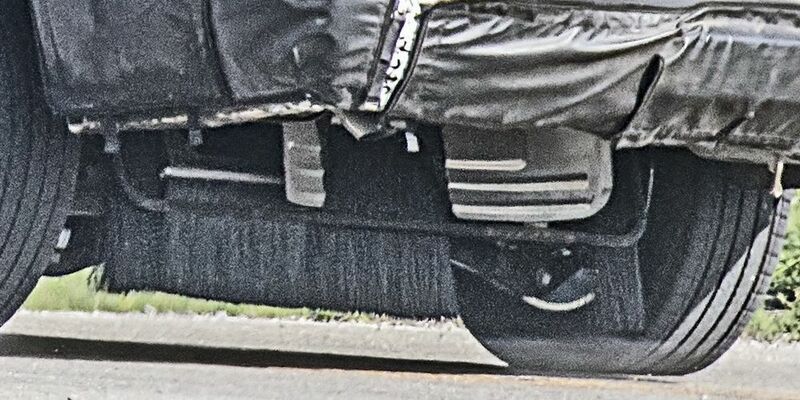 Thankfully, our spy photographers knew where to point and shoot, revealing that the SUV’s solid rear axle days will soon be behind it. 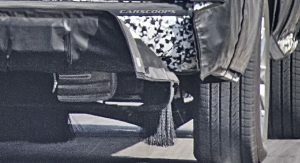 As for the rest of the body, while it remains well-hidden, we can still make out multiple design elements such as the angular C-pillar or the slightly curvy front fascia design – at least not as boxy as the 2019 Silverado. The taillights are also partly visible, but there’s no way to tell if they’re in any way new, or simply the ones from the current model. 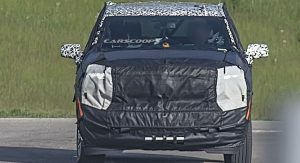 While we can’t see much of anything with regards to the interior, the 2020 Suburban should look to at least match, if not one-up the 2018 Ford Expedition, which is packed full of modern safety, convenience and off-road management systems. The 2018 Expedition weighs around 300 lbs (136 kg) less than its predecessor, thanks to its high-strength aluminum body design. Add the 3.5-liter EcoBoost unit and you’ve got yourself a considerably more efficient SUV than before. 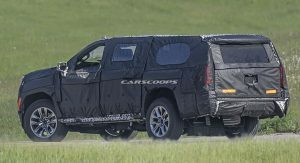 We can expect a similar recipe from Chevrolet, especially if they opt to fit the new Suburban with the Silverado’s 2.7-liter four-cylinder engine – yeah, a four-pot in a Suburban, who would have thought? 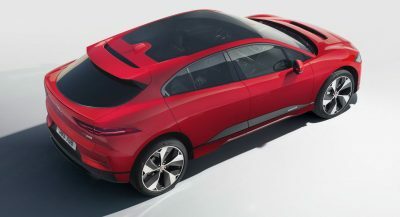 “We expect GM will use the engine in upcoming full-size SUVs and it should make a solid addition with improved standard performance and fuel economy,” said IHS Markit analyst, Stephanie Brinley. On the Silverado, this power unit produces 310 HP and 348 lb-ft (471 Nm) of torque, taking the full-size pickup from zero to 60 in less than 7 seconds. Not anytime soon. 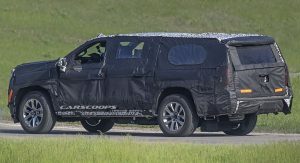 The all-new Chevrolet Suburban should be unveiled sometime next year as a 2020 model. Its direct segment rivals include the previously-mentioned Ford Expedition, but also the GMC Yukon XL. You can throw the Escalade ESV and the Navigator in there too, but only if you want to spend more. Would love the theory as to why the taillights would be the same as the current gen? 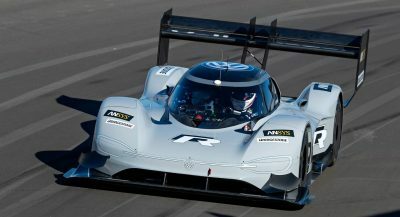 It could be because A) it’s still in an early testing phase and this is still a mule or B) it’s more of a major facelift than a redesign. That’s just my theories. Manufacturers often test new hardware under old bodies, or Frankensteined bits an pieces to assemble mules. 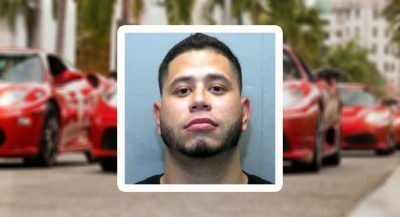 They need lights to be legal on the street, but the production ones might not be necessary or even ready. In this case, something is off with this mule’s rear wheels. If you look from the side, they are way too far forward in their wheel wells. 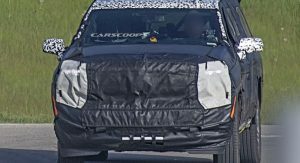 This may indicate that they are testing with the current body over a new chassis. 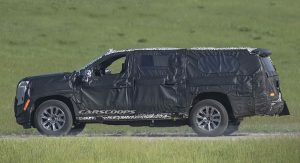 it seems that the old (current gen) rear end (C and D pillar) been welded to the future suburban or Silverado to test this chassis. Well aware, but the article makes it seem like that’s significant (i.e., that the next gen wouldn’t have different taillights). Who cares if a mule doesn’t have the new taillights?? How long before someone take the IRS & put it on truck? I’m foaming at the mouth. Oh yeah. Looks good, but I bet the c-pillar would be blacked out with window. It’s a good starting point. They’ll probably differentiate like they’ve done for the past couple of generations, but I still think it’ll look good. 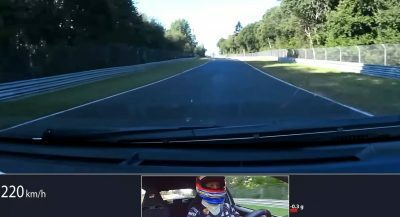 Interestingly, I thought the SUVs already got independent rear suspensions. I was wrong. I wonder if they’ll still over a dedicated 4×4 system as an option or if they’ll move to a simpler AWD strategy. That would be unfortunate for those of us who don’t care for the new Silverado’s styling. I hope it has bigger side mirrors than the current one. Those are honestly a hazard in the Yukon and Tahoe. I get that they have BLIS systems, but the mirrors are way too small. Totally agree. Its funny, the Escalade’s are fine. 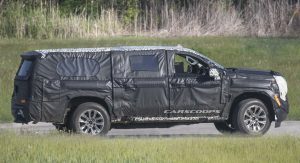 I doubt we’ll see the four banger in the Tahoe or the Suburban, considering that engine is meant to replace the V6 and that engine isn’t found in the SUVs. But hey, if Audi can sell fools a 2.0T Q7, why shouldn’t GM do the same? 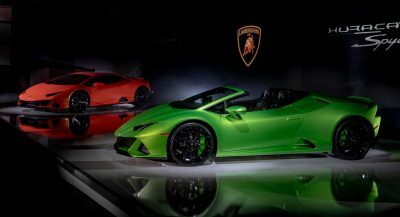 I’m actually going to bet that we will see this pop up at the LA Auto Show later on this year with a Spring 2019 release. 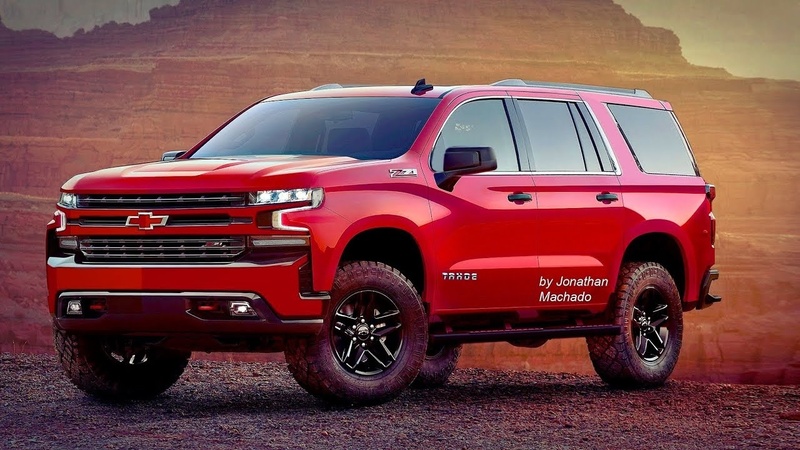 GM cannot go an entire two years without updating the Tahoe to compete with the Expedition. They’re losing sales while gas prices are still *relatively* low. And since consumers will hold off on purchasing decisions if they see something they like better, that is why I’m willing to bet we will see this revealed this year and not next year. 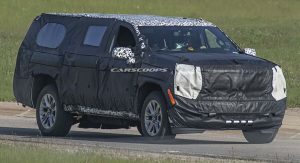 According to the test mule, the 2020 Chevy Suburban looks like it will be a little taller and bigger than the previous generation. 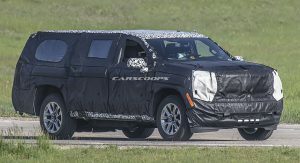 The headlights looks quite similar as the ones found in the all new silverado but the tailights look the same as the previous generation of the Suburban since this is a test mule. 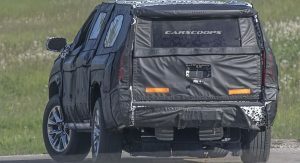 When the 2020 Suburban debuts, I believe the tailights will be a completely different design than the previous generation. It’s tough to hide that IRS. Just the fact that they’re trying to hide it means it is an IRS. But it’s still easy to tell. I’m looking forward to this one. It needs to look great and have a pretty incredible interior if its going to surpass the current Navigator.